I've recently become a fan of Open Source Living, a site that rounds up the best of the many and varied OS apps that are out there. One area that naturally caught my eye was e-Learning, given an unusually prominent position as the second section under content management, after blogging, but ahead of illustrious app categories such as forums and wikis! No doubt this is due to the prominence of Moodle which appears to be breaking out in to mainstream consciousness - popular British computing weekly MicroMart is even carrying an article extolling its virtues this week. Moodle is of course THE open source e-learning item of the moment*1. You know something is big when it even starts to be worthy of parody, but the fact of the matter is it's a success. The Open University have spent a lot of money on it, which has in turn seen more people pick it up, it is getting an enormous established user base (for something in the educational sphere its remarkable apparently*2) and its adoption in the corporate sphere is championed by no lesser luminaries of the UK scene than Kineo (2). Hailing from Greece and available in two flavours, the Enterprise edition is pitched firmly at the corporate sphere, but incurs support fees I think. From the limited screenshots it looks pretty. Like eFront this includes chats and wikis and allsorts of lovely web 2.0 stuff to supplement your training, and claims to support 'blended' learning. I hate that term, but if that means it helps manage classroom learning (so is a true LMS rather than an LCMS) then that's cool. Interestingly OSLiving doesn't even list educational establishments as the potential userbase for this LMS. Again, looks pretty. For a better insight, and an example of great minds thinking alike*4, check out Steve Rayson's review at the Kineo website. You can even log on to their demo site. Can't begin to say how cool it is that it integrates with OO Impress in a presentation-to-SCORM content model. Brilliant, and it's even called Oogie. Marvellous. Unabashedly targeting the educational sphere, this proclaims to have the stamp of approval of none other than UNESCO! What other e-learning app, or of any other flavour for that matter, do you know of to get a thumbs up from the UN? In 35 languages apparently, so hardly a fly-by-night project this. What's amazing about these (to me at least) is the level of sophistication of these apps straight out of the wrapping. The demo site of Dokeos set up by Kineo featured a chat room and even a virtual classroom. Simple they may have been, but there they were. Almost no organisation can say that they can't afford e-learning now. And what's more, the feature sets on show here eclipse any corporate LMSs I've been in contact with recently. In the brave new world of the freelance e-learning specialist that I find myself from January, I will be exploring at least Dokeos as it seems a very interesting proposition. *1 if moments can be said to last a couple of years or so. *2 it would seem schools are a fractious, clueless bunch and don't often do things together, so the edu-soft market is awash with crappy two-bit offerings or large corporations selling crap. I've been an enthusiastic convert to Cloud living since I discovered Gears, the Google extension that allows me to take web apps (Google Docs mainly) offline with me. It creates a local database that backs up your Docs data and synchs it with the online version as soon as you connect back to the 'Net. The interface for Docs suits the way I like to think more than the now clunky, hand-me-down files and folders concept of Word and its ilk, and being able to carry it around and switch between my works PC and my two home machines without needing to copy files back and forth actually helps me a lot. With this kind of platform neutral feature adding real strength to the 'the-browser-is-the-OS' argument, you could be sure that the boys in Seattle weren't going to let their stranglehold on the desktop/office slip away too easily. The response is Mesh, a kind of synchronised folder for the net generation. It requires that you install Mesh on each machine and as far as I can tell, still relies on nominated 'meshed' folders, but the basic principle is the same - work on one machine and the files will be available on any others just as soon as Mesh can check back in with the mothership (ahem, connect back to the 'Net). Since this will still, as far as I can see, perpetuate the files and folders system, I am unlikely to feel the need to opt for this in a personal capacity, but if it means flexible working without lugging the laptop for example, then I can see clear benefits. The real star of this post is actually the 2008 Learning Trends collaborative tools mindmap, but then I like to hide the subject of my posts down here at the bottom as a special treat for those of you that read this far. I've decided that it is time for a change. Reflecting on what has been happening this last year I have come to the conclusion that if I'm going to get to blog more often I'm going to have to make changes to how I fill my day. So in the interests of Learning Rocks I have opted to change jobs. Okay, so my decision to leave my current employer is not entirely about blogging, but it would be too sensible to say that it wasn't at least a tiny factor in it. You can expect more on this channel, and more frequent updates, from now on. In the meantime, I would really suggest you take a look at Charlie Brooker's Screenwipe (Series 2, Episode 3) on the fantastic BBC iPlayer. Brooker has pulled together some of the best TV writers in the UK - Graeme Linehan, Russell T Davis and more - to talk about writing. There is a lot to get out of this (especially if like me you are terrible procrastinating writer) about the creative process generally, some of which I think can be said of good ID. Highly recommended. Following Cammy's discussion on seat time in elearning (far more interesting than this post btw) I found myself at the Brandon Hall site where Janet Clarey had taken up the same question. While you are there, and hopefully adding your contribution to the debate, just check out the sweet tag cloud that seems to take its name quite seriously. Nice touch. My friend has just started his first teaching job as a graphic design lecturer at three different FE colleges. The levels of the students varies from establishment to establishment, but he admits now that setting a research project as his first major piece of work with one group was perhaps a little optimistic. I've been working with a client in the financial sector lately, so I've had my focus directed at the markets perhaps even more than I might otherwise (not that we can avert our stares from the car crash). So this is not really elearning related, but is instead a beautiful take on perspective in these interesting times - from a great blogger who is, I think, a Brit working in the financial sector in Tokyo. I am still doing a lot of work with development tools such as Articulate/PowerPoint, Captivate and most recently KSTutor, supplemented with standards such as GIMP and Kompozer. GetColor SF: In essence a standalone version of the dropper tool offered by GIMP, Photoshop et al. If you are working in PowerPoint you don't have the same luxury. 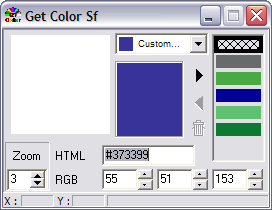 GetColor offers a great way to get the hex value of any colour on the screen, and even save them for reference. Arguably an essential addition to the PowerPoint learning designer's desktop. 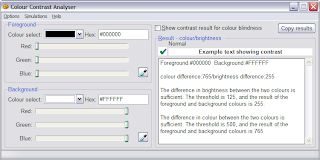 Colour Contrast Analyser: Not sure if your imagery will meet accessibility requirements? This little app assesses contrast between colours. If you are working with the likes of Ufi you may know about this, but if you aren't, especially if you are doing your own SME-centred in-house development, this is a great way to get "free" accessibility. This is a product of an Australian organisation called Vision Australia and a great example of an interest group that not only campaigns for equality but actually goes out there to make it easier for people to comply (overcoming inertia) after all - choosing colours wisely is essentially a 'free to implement' accessibility standard. 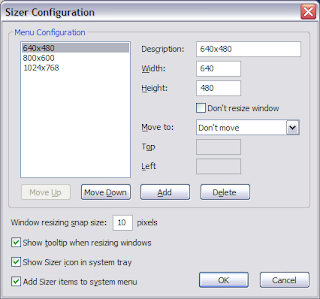 Sizer: A simple little tool that allows you to set the size of a window. With screen sizes now rapidly diversifying this allows you to choose to view at standard size, or to set your own sizes. Useful for viewing courses as your learners will see them, or for setting them prior to a capture session if you are using things like Captivate or KSTutor. We all now that in order to be able to learn effectively, just as if we want to do anything effectively, we need to be alert, energised and ready to perform. One sure fire way to damage learning before it starts is to not be well rested. Various studies show that paying attention to getting enough sleep can have a profound effect on school students' academic performance. Here are a couple: here's a pretty good article from NY Magazine, and here's a meta-study on university student performance. But getting enough sleep at the usual time can be tricky: pressures of school, work and daily living can nibble away, or simply chomp, at our time in bed, leaving us tired, run-down and running at sub-optimal levels. The solution is to nap - we've known this for a while of course, but I still get mocked for downing tools, kicking my feet out and snoozing in the office. I usually find a quiet sofa to chill on, and set a quick 12 minute timer on my phone so I can take the edge off. It would seem I've been getting some of the best practices right too, according to this brilliant article on how to nap from the Boston Globe. I am posting this here because not only is the information useful, but I like the simplicity of the article as a learning object. Nice graphics give it visual appeal, but they carry information too. The "timeline" in the middle is great because it evens outlines the nap-tactic to use for the right occasion. Thanks to Merlin Mann at the excellent 43 folders for bringing this to my attention. For a while now I've had the funny feeling that email creates at least as much work as it facilitates. Wondering if there were any other malcontents out there - I guessed there would be - I found this in an old blog entry from a guy called Lars Plougmann. He works at an organisation that promotes social software as far as I could tell. This rather amusing (though obviously made up) breakdown from August 2006 sums up how I feel about managing projects with email. Based on my own experience of taking even just a day off, and then contending with the swamped inbox full of things I, at best, may need to know, some I definitely do and a fair load I certainly don't, this seems a reasonable stab at summarising the waste. A hint that its time may have passed lies in the "e" tag which effectively marks email out as something of a digital antique - everything is "i" or "pod" now. Email is over 40 years old, but its growth in popularity and arrival at ubiquity really occurred in mid-90s, the heyday of desktop computing and the beginning of the wide-spread adoption of the Internet. At the time "always on" Internet access was something of a luxury. We were still paying by the minute for access, and in any case, the 56k speeds were so slow as to limit what we could achieve. But email, able to step online, pull down these messages from anywhere, that may have been sent only seconds before, was a miracle. Working on separate, isolated desktops was the norm and email was one of the best ways to make bridges between them. Email changed how we could communicate, work and behave, just as effectively as the postal service, the telegraph and satellite communications did before it. And, just as the post continues to play a unique part in the way we communicate, despite the fact that in many instances it is now easier, quicker and cheaper to use email, email itself will probably continue to be relevant for years to come. But for some tasks, in particular group working on shared tasks - ie projects - email, for the reasons above, has been itself replaced by a generation of tools, mostly web-based, that allow us to work in shared spaces. They allow us to easily and very effectively keep all our communication in one place, track tasks, hold meetings, share files, collaborate on documents - the list goes on. Instead of working on isolated desktops, we can work in our own project offices, each the size of the world if needs be. Or rather, email should have been replaced in this way. But it hasn't. Sadly, these email killers are not new - collaborative tools like Google Apps, Zoho or BaseCamp, forums and wikis - and yes, even blogs - are now established, familiar and robust. Yet there continues to be a blindness in those who should spot the problems and their solutions, so we are stuck giving our time to the inbox instead of something useful. For me it is ironic that so many people engaged at the intersection of technology and learning should take so long to see it. The perfect voice, the perfect podcast? I've been given thought lately to the effectiveness of podcasting as a tool for delivering training. After discussing the issue with an expert in the field I can see how it could easily be classified under the "rapid" banner too. The expert, Peter Galante of JapanesePod101, revealed that he felt that success or failure of podcasting as an enterprise lay in one or two keys features, chief of which was an an engaging voice. So, today's spurious-advertorial-disguised-as-science* piece on the BBC, courtesy of Post Office Telecoms, was actually fairly interesting. The research purports to reveal the perfect voice. Researchers tested people's reactions to a variety of previously unknown voices (ie there was no bias based on previous exposure) then the voices that scored best were analysed to find out what traits they shared. It revealed the sorts of things that people found most appealing. Issues they looked at included the tone, speed, pauses and so forth. The top voices for women included Mariella Frostrup and Dame Judi Dench; for men it was Jeremy Irons and Alan Rickman. While these folk are probably out of the budget of most elearning projects, they at least give you an idea of the kind of voices you should be looking to if you want people to receive your learning most favourably. I guess that this would come with caveats - the antithesis for these plummy tones was Jonathan Ross, but with his listening figures contributing to Radio 2's position as the most popular radio station in the UK, clearly there are plenty of people who like him. That said, he was a TV personality long before radio so it's possible he simply brings existing fans with him. However, key issues like clarity of pronunciation, richness of voice and sensible pacing are goals that can be aimed for by all podcasters. * usually these are marked by a commercial sponsor (check) and some nonsense equation (check). The best champion in the fight against most of this kind of rubbish is the Guardian's Ben Goodacre in his Bad Science column. For a while now I've wondered just how good Moodle is. On the prowl for a new project last month I decided to upgrade my package with 1&1 hosting to a compatible LAMP affair, and which gave me, for free, the option to get hold of learingrocks.co.uk which will just bring you straight back here. This afternoon I finally managed to get my head around the tweakery that was required, courtesy of the volumes on the subject in the very useful Moodle forums, and so I have a working install of Moodle. For a reasonable assessment of Moodle and its prospects, here's Darren Sidnick of Ufi/learndirect. Google have announced that they are swinging behind the social revolution with Google Friend Connect, creating APIs to enable any site to incorporate features usually associated with the likes of MySpace, Bebo and Facebook. Here's the Beeb on subject. This should mean that the task of renovating our existing learning ghettos - the soulless, dank, lonely homepages of most LMSs - should become a whole lot easier. 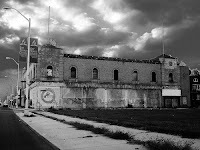 Places of learning should not resemble the online equivalent of the East End of London, circa 1970, or the Detroit of countless straight-to-what-was-once-video -but-is-now-more-likely-to-be- DVDs - that's to say empty places where all you will hear is the echo of your own mouse click. No, if we want people to learn, or more importantly if we want them to want to learn we need to create hospitable places where they get the sense that there are other people around doing what they're doing. Learning. On a more balanced note, Brent Schenkler has a great post that tries to combat the erroneous binary opposition that it's social networking OR face to face. At last: AICC and SCORM elucidated! When I crossed the fence from elearning organiser to instructional designer, I half expected to be indoctrinated in to my new world, perhaps with a funny ceremony in a darkened room, or a the very least with a FAQ of top elearning bepuzzlements and an explanation of what LMSs did. I never got my first wish, and blogging was what took care of the second, but sadly it's taken nearly two years to get the solution to the last issue. RoboNekp, or perhaps more likely, Rob on NKP, has published this comparison of the two main standards, SCORM and AICC, which finally clarifies a couple of points that I've wondered about. I'm probably a latecomer to this particular party, but I recently read Steve Krug's "Don't make me think". If you're not familiar with this great book but you design elearning, or work with it, I really suggest that you at least spend an hour down your local Borders and flick through it (it's so well put together that you'll get most of the take-away points in that time). Krug is a web-usability expert, and since the publication of the first edition of this book in 2002, I think he probably deserves the epithet "guru". Krug central premise is summarised in the title of his book - anything that makes your users think twice about anything other than what they are trying to achieve when entering your website is an error. For Krug, the enemies of good design lie in splash pages, deviant navigation, unnecessary words, buttons that don't look like buttons (and non-buttons that do), CEO-inspired "wow-factor" - in fact, Krug's enemies are, by and large, enemies that should be common to elearning designers. Krug's lesson is a simple one, but one that segues neatly with the work of elearning sciencey types like Clark and Meyer. Where Krug sees a fraction of a pause and a loss of good will, Clark and Meyer would probably sees cognitive interference. One part that really struck a chord with me is Krug's advice to try to stick to recognised navigational patterns. As a reference he unapologetically refers to Amazon's way of doing things - many of the best facets of commercial web-design are on display there - if perhaps they weren't devised for it in the first place. I'm doing quite a lot of rapid approach content of late - mostly with tools like Articulate - and one good feature of these tools is the interactions are quite straight forward; the learner soon forgets about the interface and can concentrate on the learning. At the same time, reviewing a couple of courses I wrote a couple of years ago I can see some instances where "cool" interactions I thought up to explore content are more than likely going to cause my learners to blow a fuse, or at the very least break the flow of their learning. The author, some MSN intern, looks at a Which? study (Which? is a consumer magazine in the UK) that reveals that the majority of people would like simpler gadgets. Our author, let's call him Patrick, thinks on this and spots a very reasonable reason for the dischord between what people are after and what they get - 'feature lust'. In short, we think we know what we want - a simple TV - but we go and buy bells and whistles. The shopping list is usually pretty simple upfront: cheap way to train X,000 staff in Y weeks, budget £Z. And often enough this could be achieved with a little thought and sacrifice. Except that what gets added to the mix is the need for vip videos, branded graphics, pizazz, wow factor, "engaging interactions" - the list goes on. And the list rarely includes anything that will impact the learner in a positive way. More often than not, of course, the person buying the TV will go into the store knowing what they're after but will be "persuaded" by a sales person to buy the SuperBlack screen and the 7D Immersive Audio. And likewise the elearning sales person is as much to blame for some "training" decisions that are not in the best interests of the learner. I think that this point also crosses with Donald Clark's article on the UK eLearning press - these magazines, that land on the desk of pretty much anyone who as ever so much as hinted at the idea they might buy or sell any amount of elearning, sell a vendor-friendly view of elearning, typically hinging on the next great technology that one or more of their advertisers is looking to make a return on. Which is a shame, for there is a lot to be said for keeping things simple. A neat summary of some key ways to express yourself in a friendly, conversational tone here on a post from Pick The Brain. All too often, writing on behalf of an organisation seems to disengage the normal part of the brain that people usually rely on to communicate and instead adds some kind of 'quasi-formality loop'. The article discusses the research in the book 'eLearning and the Science of Instruction' that shows that there are real learning gains to be made in addressing learners in a way that reflects conversation - in effect 'tricking' the brain in to thinking that it is part of a conversation which is an activity that we somehow rate as more valuable, hence more memorable, than simply reading. Since we all know how to talk, ensuring that we use a more relaxed tone in addressing learners is, in effect, a free benefit. Great stuff. Got a NYR to learn a language? It wouldn't happen to be Spanish, would it? If so, I have the thing for you. JapanesePod 101, my favourite Learning 2.0 opportunity (even if the LMS behind it could do with some work), have now extended to other languages, Spanish and, given that they are based in Japan this is useful, English. They are offering extended free trials to anyone who has signed up to J-Pod, and to anyone they know. on iTunes of what you think (and please be nice). simply follow the links below and click the "subscribe"
I can endorse the approach of J-Pod and if they are extending the same model to these two offerings it can only be good. Give it a go! Oh yeah, happy new year by the way.